This website is for anyone interested in the products of Bristol Commercial Vehicles, a manufacturer swallowed up by British Leyland and a tragic victim of the politics of the 1970s and early 1980s. The models we deal with in full detail are the VR (Vertical Rear-engined) double decker, the remarkable Lodekka half-cab low-floor double decker and the single-deck RE (Rear-Engined) and LH (Lightweight Horizontal-engined) models with every single chassis listed from original owner through all subsequent owners to final (or current!) resting place. It is a sad fact that in 2019 all Bristols are now extinct in normal service but many VRs remain in use in the U.K. withcertain operators and also in non-PSV roles. By contrast there are now well over 200 VRs recorded in various states of preservation in the U.K. with many more continuing to earn their keep in a multitude of uses around the World. Ever-faithful Lodekkas also continue to earn their keep in all corners of the World, some of them now well beyond their sixtieth birthday, while many are still in private hands in the U.K. Finally there are also many preserved REs and LHs that continue to provide nostalgia and enjoyment at events around the U.K. The aim of this website is to be the historical point of reference for all Bristol VR, Lodekka, RE and LH vehicles. It is still being updated daily with current and historical information. Ultimately it is the intention to have a profile page for every one of these vehicles that were built including photos with every owner in every livery. Obviously this is a lifetime's work and will not be achieved without the help of a great many contributors - these kind folk have already helped to swell the number of photos held for publication to over 45,000, many of which are already in use on the site. I am very careful not to breach copyright but if I have used any of yours inappropriately please contact me and I will put it right immediately. With the dramatically reduced activity in the Bristol vehicle world in recent years I now record all major vehicle changes and items of interest on the Recently Recorded Changes Log. You asked for it so here it is! I acknowledge that this website has not been the easiest to navigate, having grown organically over a period of 20 years, so I have put together a complete list of all areas of the site with links to find your way to every corner. I hope you find something new and that you enjoy this facility. 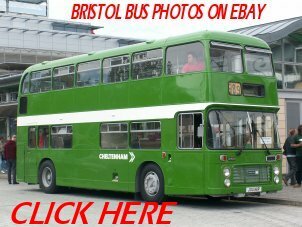 I do not charge any fees for listing Bristol vehicles for sale on this page, but I regret I cannot advertise events due to lack of available time. I do however list Bristols advertised on eBay in the hope of alerting buyers who may otherwise miss the opportunity and have added a few additional links to interesting eBay categories such as those for Photos and Models at various points on the website. I hope that whether you are a regular visitor to this site or you have simply stumbled across it you can sense the enjoyment I have derived over many years in compiling it (and continue to do so - there's still a long way to go before I'm "finished" documenting these wonderful timeless vehicles). I have recently started a number of new pages which deal with the more unusual and noteworthy aspects of operation and use of the VR, Lodekka, RE and LH models and I thought it was time to share the links for these new pages with you. All are still very much under construction so do please come back periodically and see what I have added. The first page deals with unfortunate incidents resulting in fire and accident damage. Next comes vehicle liveries (this will take a long time to complete and the list is so far very incomplete). Finally there is a repository for operations, uses and conversions which I think merit their own separate entry which I am calling Unusual Bristols. I have also listed some coverage of Bristols on YouTube. If you have any contributions for any of these pages I would be delighted to hear from you. Please help to support this website by using this link. Anything you buy (not just bus-related items) on eBay, having clicked through from here, results in a commission payment of a few pennies which I put toward the cost of having this website professionally hosted. In addition to listing all operators of VR, RE, Lodekka and LHmodels I am now also recording all liveries carried by individual vehicles. 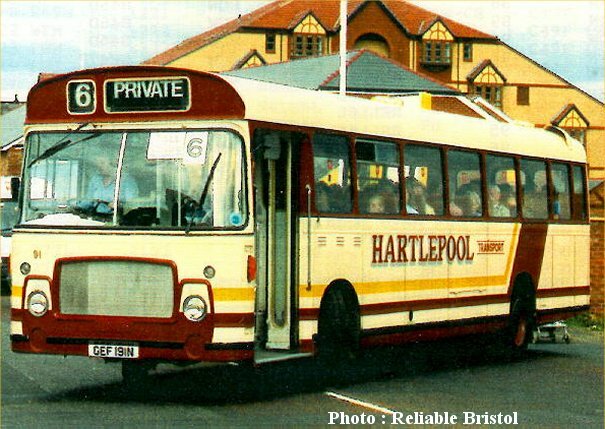 An interesting operator of RELL single deck buses was Hartlepool Corporation who bought 58 new examples between 1967 and 1975. All are listed with disposal details here and all standard liveries are listed with links to available photos here. Advertising and commemorative liveries are listed here. I hope these pages prove to be of interest. The Operator Focus Archive contains a log of previously featured operators. If you can contribute to fill any gaps or correct any mistakes I'd be delighted to hear from you. Sholto Thomas, joint owner of former Brighton, Hove & District KPM91E has been in touch to report its latest move, this time back much closer to home in Southdown country. It has also been repainted in beautiful original red and cream livery which it would have carried as a closed top vehicle when brand new. It has already been spotted at the Stagecoach Winchester depot and will no doubt be seen around and about at rallies this year. This is the latest photo in a regular feature intended to showcase the work of some of the very kind contributors to this website to whom we are very much indebted. The Illustrated Histories Log page details those vehicles that have already been processed. More are added every month. If you can help to complete any with either additional information or photos I would be delighted to hear from you, either through the submission of photos or slides for scanning, or through the email of digital images. You will find my Contact Information at the foot of this page. All current VRs operated around the UK. Playbuses, exhibition units, caravans, etc. They're all here. Over one hundred and eighty VRs are already in preservation. Keep up with their progress here. Here you will find all VRs that were manufactured with links to subsequent owners. This list shows all original owners and links to lists showing all known survivors, all others being marked as scrapped. Every RE ever built is listed here with links to all subsequent owners. Every LH ever built is listed here with links to all subsequent owners. Every Lodekka ever built is listed here, with links to all subsequent owners. Gerry Tormey has also now completed a superb site devoted to the Bristol MW. Follow the link above. ...and this one for the integral Bristol LS model. 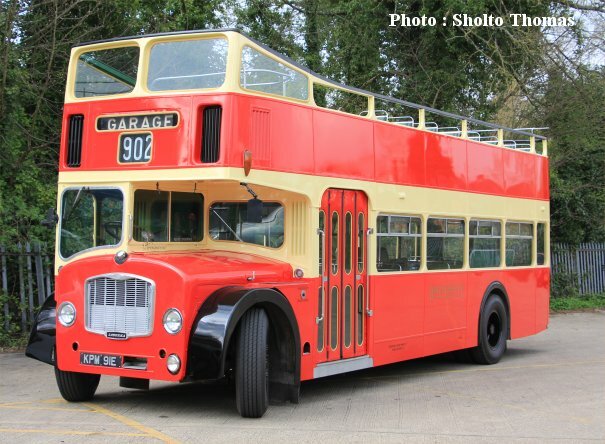 Here are Gerry's two latest websites, dedicated to these grand old Bristol single deck models. Your webmaster would be delighted to hear from you about anything Bristol/ECW-related. His email address is rob@robsly.com. Following the use of JOU161P on free services in and around Cheltenham on Saturday 12th September 2009 a video of it appeared on YouTube, thanks to the prolific camera of Simon "Video47". This has prompted me to add a new page to this website where I will add links to videos of Bristol VRs, REs, LHs and Lodekkas across the Internet. If you find any more do please drop me a line at rob@robsly.com and I will build up this library of material. I thought it might be nice to have a forum whereby readers could easily comment on and raise issues about the website, chat with me and with each other and help with information and photos for use on the website. I have therefore added a page on Facebook where I will periodically post photos and information that might not normally make it onto this website. I have started off with four photos of Bristol Lodekkas which I hope we might be able to identify and thereby add to the historical record on here. Do please become a fan of this website - I look forward to seeing you there! Fantastic news is that after 22 years "missing in action" Series 1 flat-front VR BYG851H, former West Yorkshire VR44, has been spotted in good condition in Morocco. It was parked just off the main road heading back into Tangier from Cap Spartel and the "Caves of Hercules". 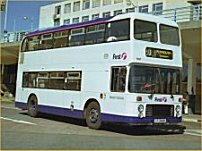 Unfortunately Clive Williams (whose quick thinking provided enough of the registration to check its identity on this website) was on a tour coach at the time so it was impossible to get a photo. My request to readers is for anyone who finds themselves heading out to Morocco to keep their eyes peeled for this one (and to carry a camera with them!! ).